Need a stylish design for your Joomla website? Would you like to get a premium Joomla template at a special price? Then this is the right place for you to be. Read on and learn how to save when buying Joomla templates. Actually, it’s quite easy to get Joomla templates at half price. 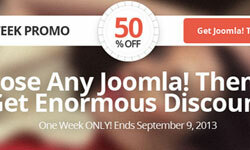 The point is TemplateMonster, a US based theme company, is now offering a 50% discount on Joomla templates. However, it’s a time-limited offer which expires September 9th. Here are a few words about TemplateMonster: the company has a huge range of website templates, including CMS templates, eCommerce templates, Flash templates, etc. If you’re a fan of Joomla, you’ll be pleased to know that there are more than 1300 Joomla templates at templatemonster.com and many of them are responsive. For the convenience of users all Joomla templates are divided into different categories, such as Business, Fashion, Sport, Music, Hosting, Real Estate, Education, Law, Travel and many others. However, you can not only sort templates by category, but also by color, by style or by keyword. Finally, it will not be a problem to find Joomla 2.5 templates or Joomla 3.1.5 templates in TemplateMonster’s collection. You just have to check the version of Joomla you’re interested in and you’ll see the templates which are compatible with this version. We hope this information will be helpful to bloggers, designers, developers and anyone looking for Joomla templates, because it’s nice to know where to get beautiful designs for Joomla websites, especially if you can get them at half price, don’t you agree?